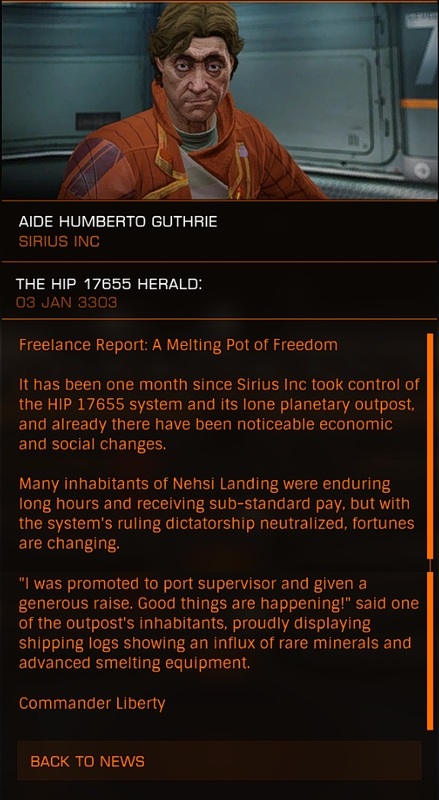 It has been one month since Sirius Inc took control of the HIP 17655 system and its lone planetary outpost, and already there have been noticeable economic and social changes. Many inhabitants of the Nehsi system were enduring long hours and receiving sub-standard pay, but with the system's ruling dictatorship neutralized, fortunes are changing. "I was promoted to port supervisor and given a generous raise. Good things are happening!" said one of the outpost's inhabitants, proudly displaying shipping logs showing an influx of rare minerals and advanced smelting equipment.